First of all, what is simulcasting exactly? Simulcasting is not live streaming a regular church service (although your church might want to consider that as well). Simulcasting is when your church streams an event being held somewhere else. Probably the most popular and common example is a youth group Super Bowl party. Youth groups and some churches across the country host community or small group events streaming the NFL’s championship game where everyone can come together and argue about whether the game or the commercials are the most interesting part (theologically speaking, it is the commercials). But simulcasting is not just about sporting events, it is an increasingly popular and important way to reach your church’s community and meet their specific needs. Many of the most popular and influential speakers in the world host events and conferences that are simulcast and can be streamed by your church. The biggest reasons that simulcasting is growing is because the technology is maturing, we have faster internet and better screens, and our culture is increasingly using streaming as a method of communication and even community building. But just because something is popular and can be done well, doesn’t mean that churches should be doing it. 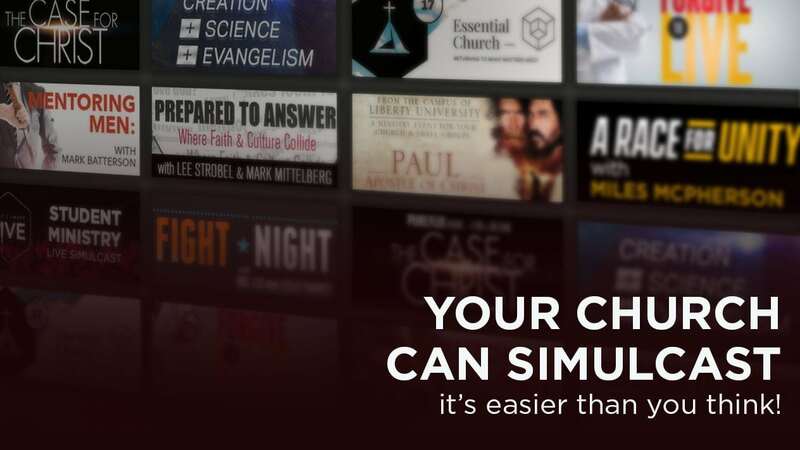 And simulcasting isn’t a perfect fit for every church but it is a good fit for many of them. Here are some of the best reasons why yours should consider simulcasting and event. The biggest objection to simulcasting is that streaming just isn’t the same as a real-life event. And that is absolutely true! Ask any youth group leader if they would rather host their Super Bowl party physically at the Super Bowl or in their church basement, the majority of them would prefer be packing their bags before you even finish the question. Of course, world-class, live, in-person events are the ideal scenario, but just because a concert is the best way to experience your favorite artist doesn’t mean that you should toss out all your CDs and cancel your streaming subscription. Simulcasting isn’t trying to replace those live events, it is augmenting them, making it possible for anyone in your church or community to participate when they wouldn’t normally have an opportunity to do so. And the best part is that most simulcast events have group participation materials, meaning that your event is still partially live, with the vital follow up and face to face care that fosters long term change and not just a mountain top high. The actual streaming is just one facet of these events, but it is the part that is most likely to draw in and attract members of your community. Just like the Super Bowl may be the marquee event for the youth group, but the devotion or even altar call are the real reason. Does your church have an expert in adoption on staff? Most churches don’t. But if your church wants to provide the unique care that the many families on both sides of adoption need then you might want to consider hosting an adoption-related simulcast. Some of Christianity’s best experts on the challenges of adoption can be streamed live to your church as a way to address the needs that your church might not otherwise be equipped to handle. In this same vein, it is a great way to find ways that your church should grow. Simulcasting a men’s conference may turn up a deep in need in your community that you weren’t even aware of prior to the simulcast. Seeing that need would show your church the importance and value of developing a more in-depth men’s ministry. Simulcasting is a way to meet your community’s needs with a laser focus rather than an overly broad generalized approach. Increasingly, our culture is communicating digitally. This fundamental shift is truly a cultural change and the equivalent of your local community gradually speaking a new language. Because of this, many churches have been falling behind in reaching their community as they struggle to learn the new “language.” Simulcasting is a way to bridge that cultural gap. It is a way to reach out digitally and transition to in real life. A simulcast event is not just one that exists in the main sanctuary or auditorium, it is something that can be translated to the church website, social media channels, and even into the homes of small group hosts that might be participating. If your church is struggling to reach and connect with digital natives, simulcasting is a great way to do so without abandoning or casting aside the older generations that are a faithful foundation of your church. Of course, simulcasting isn’t for everyone in every case. Simulcasting does cost money. Most churches are not only able to recoup the cost but use the event as a fundraiser. Like any other event, however, you need to be able to sell those tickets in order to cover the cost. Hosting a student ministry event for a group of baby boomers might not exactly sell out. And even an event that would theoretically be popular may be a flop if not marketed properly. Fortunately, most simulcast events come with marketing and promo materials. It is in their interest to help promote the event after all. If your church is interested in hosting a simulcast event, or if you think your community might have a need that isn’t being actively addressed by your church and want to find out, then there are several organizations that regularly host events. Inciite Events is one of the top industry leaders and is our recommendation from a technical standpoint but their strength is probably more in their variety of events. There is sure to be something that is a good fit for your church. Check it out, because hosting a world-class Christian event is probably going to be a little more beneficial than whoever is playing the halftime show at the Super Bowl this year.